A car slammed on the brakes in the middle of a highway. 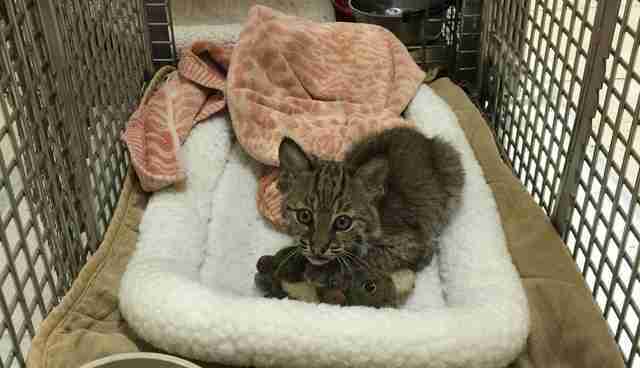 A kitten was crouched on the road - and if she didn't move, she was going to get hit. The driver parked on the shoulder and ran into traffic to scoop the kitten up. At first glance, the animal looked like a normal house cat. Then the driver studied the kitten's wide hazel eyes and a short stumpy tail, and realized this was no ordinary kitten. 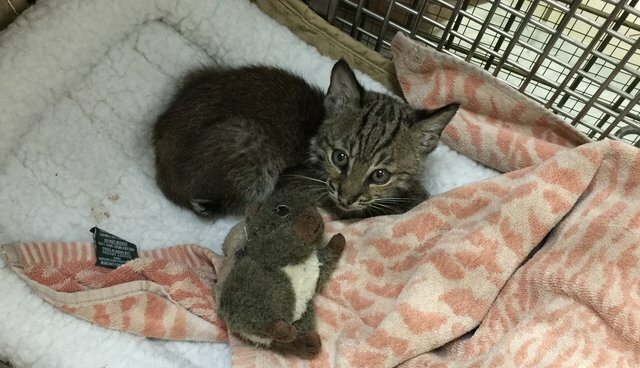 Later that evening, Jamie Veronica at Big Cat Rescue got a phone call to pick up a bobcat kitten at a veterinary hospital. When Veronica and her colleague arrived, the kitten was still taped up in a cardboard box the driver had placed the animal in ... and she was not happy about it. "We had to un-tape that box and put on some really thick work gloves so that we could transfer her to our crate," Veronica tells The Dodo. "She was very feisty right off from the start. 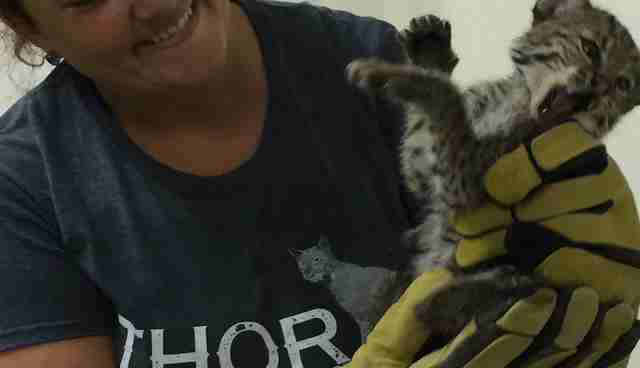 She didn't want to be picked up, so she was hissing and growling and nipping at the gloves." According to Veronica, the kitten's feistiness was a good sign: "We don't want them to be nice or friendly towards people. 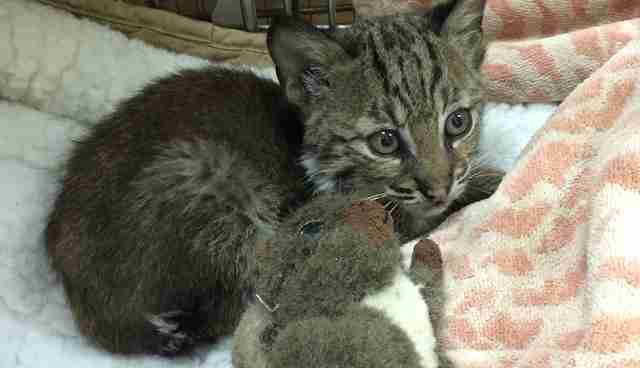 So she was being exactly what she should be - a wild bobcat." The only thing that appeared wrong with the kitten was that she was a little underweight, possibly due to tapeworms or another parasite. Then, of course, there was the fact that the kitten had gotten separated from her mother. 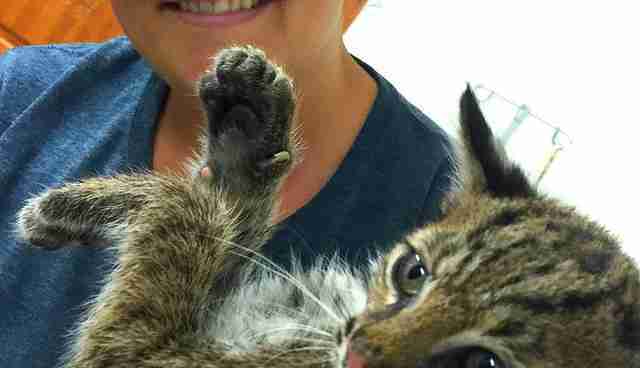 "The whole way to the location where we picked up the kitten, the road is under construction," Veronica explains. "A lot of times, when they're doing a lot of development in the area, it displaces the animals that live in that forest. They start to move to try to find new territories to live in, and start crossing roads that they normally wouldn't, and during that time they can get easily separated from their parents if there are cars going by. But we don't know for sure. 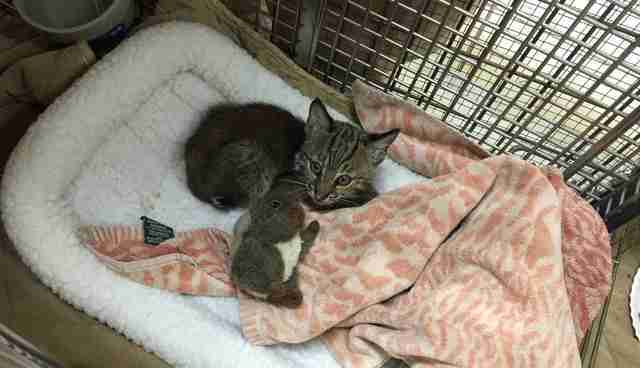 It could have been possible - maybe the mom and the other kittens were sitting in the woods." 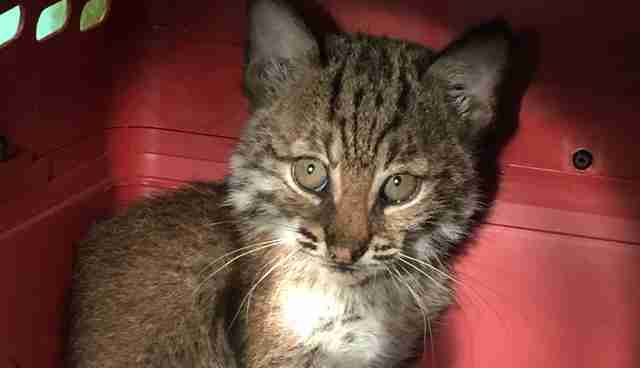 The bobcat kitten, whom they named Spirit Feather, will spend about three months at Big Cat Rescue before she can be released. "Right now, we estimate her to be about 2 and a half months old," says Veronica. "She needs to be about 6 months before she can go back. But it all depends on growth rate - she needs to be a certain size so she can take down appropriate prey to survive." While Spirit Feather waits to grow up, she has plenty to do. She spends a lot of time sleeping, sometimes snuggled up with her stuffed animal squirrel. But when she's awake, Spirit Feather loves tearing up cardboard boxes. "We gave her a little cardboard box in her cage last night, so that she could get into it and feel like she had a little den," says Veronica. "When I came in this morning to take care of her, the whole box was shredded, and bitten and pulled apart to shreds, so she must have had a really good time last night!" Spirit Feather also likes giving the Big Cat Rescue team attitude. "She's adorable until you have to try to move her to a different cage," says Veronica with a laugh. "Last night we had the veterinarian come out, so we had to pull out of the cage so we could do an exam, and do the blood test for her, and she was not happy about that. But she is really stinking cute." Big Cat Rescue does more than rescue and rehabilitate big cats - they also try to educate the public about the animals they care for. "Bobcats are often misunderstood," says Veronica. 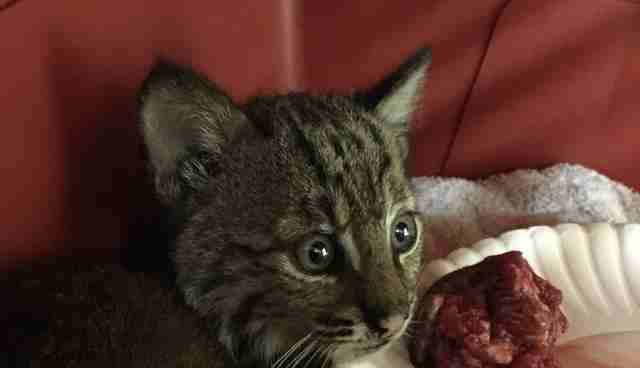 "We get a lot of calls from people who see a wild bobcat in the woods behind their house, and they're afraid of it. But they're really great neighbors to have. Bobcats don't want to come around people, they don't like to bother people's pets. But they do eat snakes and they eat rats - things that you don't want near your house."